Recent market volatility over the last several months has been surreal. We've gone from December 2018's -9.2 percent decline in the S&P 500 representing the worst December since 1931 to January 2019's 7.9 percent return representing the best January performance since 1976. Such a rapid turn of events begs the question, "Was it all just a bad dream?" The answer to that question depends on what one believes were the ultimate causes of the decline and what the outlook is for 2019. If you believe the fourth quarter 2018 decline was largely due to an aggressive U.S. Federal Reserve and rising trade tensions between China and the U.S., then the fourth quarter nightmare was likely just a bad dream. However, if there are other forces at work, then we need to ask if the market's rally off the December lows has gone beyond what the fundamentals would dictate, and is the market underappreciating other factors at play? The Fed was a large part of the decline during the last few months of 2018. We pointed this out in our last article in which markets reacted widely to Fed speeches and press conferences. Part of the anxiety felt last year stemmed from the perception that current Fed Chairman Jerome Powell was more pragmatic than his predecessors as he was not an "academic," being the first non-economist to hold the job as the Federal Reserve Chairman in over 40 years. Chairman Powell was also seen as more hawkish than his predecessors, Ben Bernanke and Janet Yellen, which was put to the test months into his career when the S&P 500 plunged more than 10 percent from its January 2018 high to its February 2018 low. Powell did not comment on the decline while his two predecessors were often more willing to pontificate on the undulations of the market in their speeches or go so far as to unleash gobs of liquidity in Bernanke's case or put off planned Fed rate hikes in Yellen's. When the market plunged over 10 percent from its all-time high in September of last year, Powell's right-hand man, Vice Chairman Richard Clarida, commented in early December that the market should not think the Fed was there to backstop a decline. Such thinking was only temporary as a further 10 percent decline from those levels exceeded the pain threshold for the Fed, leading Chairman Powell to make a complete pivot and not only go on pause regarding further rate hikes but to even mention that it would begin looking at ending its balance sheet reduction program. One of the largest reasons why we do not feel new highs are around the corner is our expectation for the economy to continue to slow well into the summer, which will impact consumer spending and corporate earnings. Last year the U.S. economy saw real gross domestic product (GDP) grow at an annual rate of 2.9 percent, matching the high for the cycle set in 2015 and accelerating from 2017's 2.2 percent growth aided by Trump's tax stimulus plan. In our second quarter newsletter last year, we called for a growth slowdown ahead for the U.S. economy and it does appear that the fourth quarter was the high-water mark as quarterly real GDP peaked at 4.2 percent in the second quarter and decelerated to 3.4 percent and 2.6 percent in the third and fourth quarters respectively. The economic deceleration that began in the second half of last year looks to have continued into this year as the Atlanta Fed's real-time estimate for first quarter 2019 real GDP is coming in at a snail's pace of 0.40 percent while the New York Fed's real-time estimate comes in at 1.4 percent. 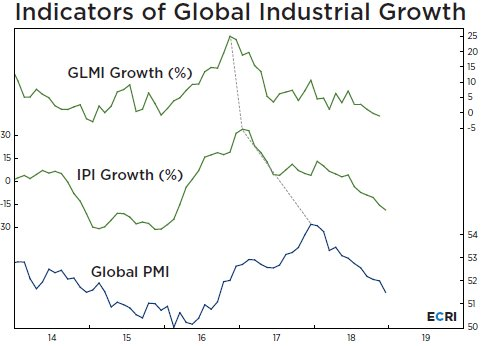 Most economists are expecting a re-acceleration after a likely poor showing for economic growth this quarter, but we believe that economic growth will continue to disappoint as we do not yet see a trough in the current slowdown based on the message from our leading economic index (LEI). The U.S. LEI we developed is based on data from the manufacturing and service sectors as well as housing and employment. It typically leads the Conference Board's LEI and has yet to show any hint of a trough. In fact, our LEI recently plunged into negative territory with the lowest reading seen since the 2007-2009 Great Recession, which does not bode well for the U.S. economic outlook. At our current reading of 97, we are clearly late-cycle and investment risk rises materially as we move further into the business cycle. Now is not the time to throw caution to the wind and take a sanguine outlook as recession soon follows when our business cycle index turns down. In the table below, we show the S&P 500's forward returns at various levels of the business cycle broken up into five segments. The market's cumulative return out 12 months, 24 months and 36 months is greatest at the beginning of the business cycle and diminishes as it progresses. This is shown in the table below which looks at the S&P 500's forward returns when our business cycle index is rising. When we are in the upper quantile, the market's 12-month forward return has averaged only 1.0 percent, but turns negative when we look out two-three years. Labor Market: Continuous jobless claims last month hit their highest level in 11 months. February's 20,000 payroll gain was the weakest since September 2017. Bank Lending: Auto delinquency (+90 days delinquent) rates are highest since April 2012. More than seven million Americans are delinquent on their auto loans, surpassing the peak set in 2010. Delinquency rates on consumer loans are at their highest rate in five years. ISM manufacturing PMI hit the lowest level since November 2016 - evidence that the U.S. isn't isolated from the weakening global-growth picture abroad, and continues to be a poor backdrop for U.S. manufacturing in 2019. Looking at recessions since the late 1970s and treating the 1980 and 1981 recessions as one long recession shows that continuing jobless claims bottom on average between 16 and 17 months before the onset of a recession. Should the low set in October of 2018 hold, we could be staring at a recession in the first half of 2020, something that clearly bears watching. We're all familiar with the narrative of an aggressive Fed and a trade war with China behind the fourth quarter decline in the U.S. stock market. There's also the analogy of the current decline and the one we experienced in 2016, which laid the foundation for the strongest period of global synchronized growth since we came out of the 2007-2009 Great Recession. We argued against this comparison in our January letter as we had yet to see a bottom in global economic activity. This is still the case and yet the comparison in the investment community remains despite continued economic downgrades. Just last week we saw the European Central Bank (ECB) slash its 2019 and 2020 outlooks to justify delivering a fresh round of monetary stimulus to help slow the economic decline of the eurozone. "The global expansion continues to lose momentum,'' the Paris-based Organization for Economic Cooperation and Development said as it downgraded almost every Group of 20 nation's economy. "Growth outcomes could be weaker still if downside risks materialize or interact." Its new GDP tracker puts world growth at 2.1 percent on a quarter-on-quarter annualized basis, down from about 4 percent in the middle of last year. While there's a chance that the economy may find a foothold and arrest the slowdown, "the risk is that downward momentum will be self-sustaining," say economists Dan Hanson and Tom Orlik. The bullish comparison of the 2016 global upturn to present is premature as economic data in most global economic regions years back turned up prior to the bottom in global equities which supported the rally in risk assets. 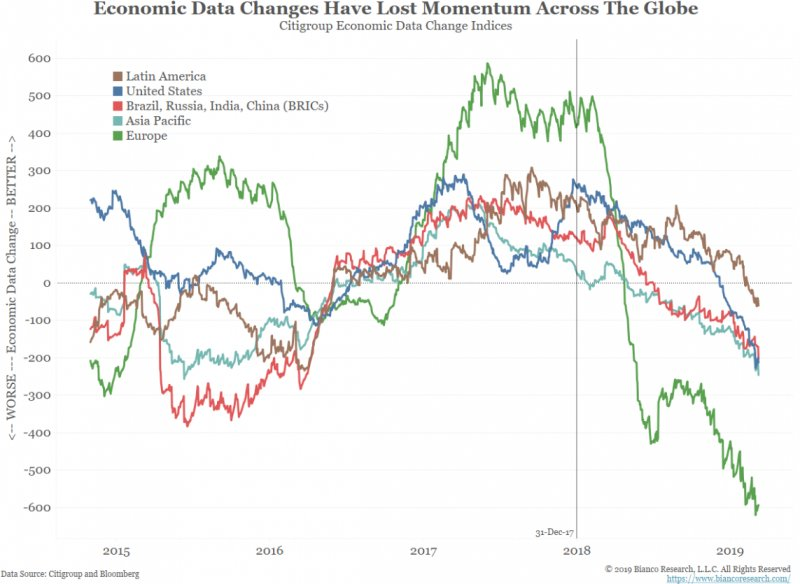 However, as clearly illustrated by Citigroup's Economic Data Change Indices, there is no visible upturn in any major geographic economic region to support the rally in risk assets that we have seen in 2019. The Economic Cycle Research Institute (ECRI) has a long track record of accurately predicting turns in the U.S. and global business cycle. While every economist was drinking the global synchronized growth Kool-Aid at the start of 2018, they predicted a sharp slowdown in global growth as early as October 2017 (See "Global Growth Outlook Darkens"). Given their early and accurate warning of a global slowdown, their current outlook should be given serious consideration. Are they in the global recovery camp and drawing the comparison to the 2016 upturn? Not at all as the following report from ECRI last month illustrates. After major stock market declines, there is typically a period of indigestion in which the market finds its footing and begins the process of forming the foundation of a bottom before advancing. Throughout the current bull market, we have seen major declines followed by a period of consolidation before a new, sustained rally took place. We saw this after the sharp correction in 2010 as well as the mini-bear market of 2011. 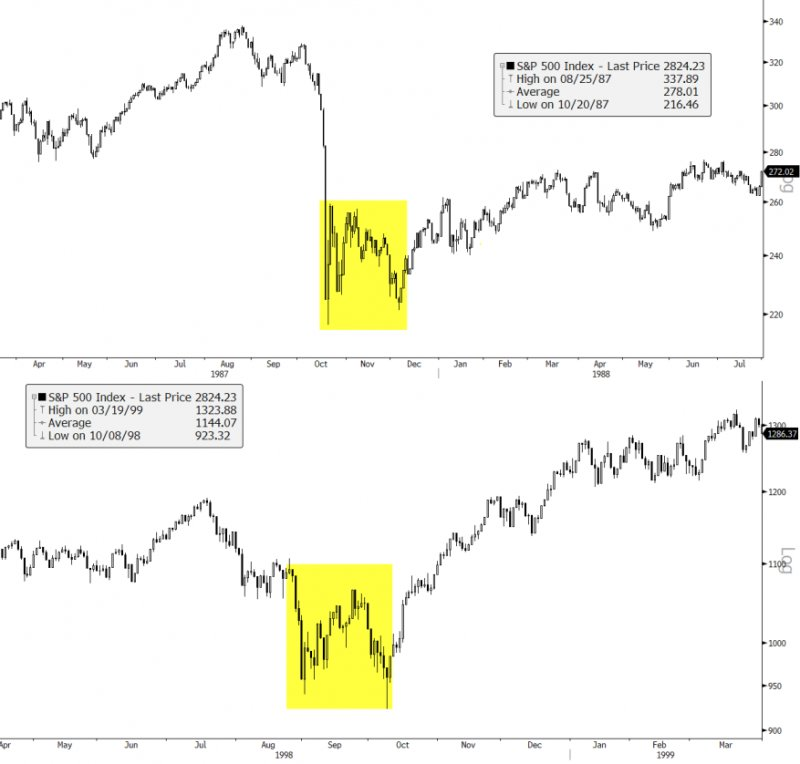 During the steep 2015 and early-2016 corrections, the market retested the initial lows before resuming its march higher and took a couple of months to form a solid bottom. One of our strongest investment convictions over the coming months is a significant top in the US Dollar (USD). A peak in the USD is likely to form this year as the economic growth premium the U.S. has witnessed over the last two years to the rest of the world, due in large part from Trump's tax stimulus, is likely to reverse as global growth stabilizes and U.S. economic growth continues to cool. Peaks in the USD are typically associated with outperformance of foreign equities relative to the U.S. as well as stronger returns in foreign currencies and commodities. The recent Fed pivot away from expecting two rate hikes in 2019 to none will clearly pressure the USD lower. A lower USD will be a continued boon to emerging markets (EMs) as many EM countries borrow in dollars. Additionally, stronger EM currencies will help to cool their local inflation rates and provide relief both to their consumers and corporate profit margins as input costs stabilize. While a weaker USD will likely be a positive catalyst for EM countries, the missing and key ingredient for sustained gains in their equity markets will be stabilization in global growth. On that point, the OECD Leading Indicator for the largest seven economies has yet to stabilize. EM equities tend to correlate with trends in growth for the global economy so the current rally in EM equities could be at risk if the stock market is discounting an economic turnaround that does not materialize. The correlation between global growth and EM equities is shown below. The current consensus view is that the nightmare seen in U.S. equities in the fourth quarter of 2018 was just a bad dream largely caused by an overly aggressive Fed and rising trade tensions between the U.S. and China. With both of those sources of stress on the markets behind us, the stock market continues its advance that was abruptly halted last year. A major catalyst to fuel further market gains, many believe, is a replay of the 2016 bottom in stocks in which a global growth downturn ended and was followed by strong synchronized growth. The bottom in global growth began in late 2015 and was already beginning to turn up in early 2016 when markets bottomed. Currently, markets have rallied strongly AHEAD of an upturn in global economic growth and is why we believe much of the strength in U.S. equities looks overdone. In our view, a period of cooling appears likely in the months ahead until the market's rosy belief for the outlook turns into reality.